This month's Food 'n Flix pick is the 1995 drama A Walk in the Clouds starring Keanu Reeves and Aitana Sánchez-Gijón. Although this movie is over 20 years old, it was my first time watching it. Growing up in the time of Bill & Ted and Point Break, I can't help but be a Keanu fan. And the female lead is actually the stars of one of my favorite shows, Velvet (a Spanish show that I discovered on Netflix...I am very impatiently waiting for them to add season 3). A Walk in the Clouds is set in 1945 at the end of World War II in California. Paul, a young soldier returns home from war eager to start a family with the wife that he barely knows. At her encouragement, he returns to his previous job selling chocolates, even though it isn't what he wants. On the train, he meets Victoria, a young woman heading home to face her family with the news that she is pregnant and the father has abandoned her. After a short series of events, Paul offers to go home with Victoria and pose as her husband so that she can avoid the certain shame she faces. Her Mexican-American family owns a beautiful vineyard that they call "Las Nubes", which means "the clouds". They arrive just before it is time to harvest the grapes. Their plan is for him to stay one day and then sneak away during the night, leaving a letter explaining that he has gone. But their plan is derailed by Victoria's traditional and demanding father, as well as the rest of her family. As you can probably guess, they fall for each other. The story basically revolves around that. Of course the fact that Paul is already married comes into play...but is resolved in the end (I won't give any more away). This isn't a typical "foodie movie", but there is plenty of inspiration to be found. You can probably guess that there are some delicious looking chocolates offered up...Paul being a chocolate salesman and all. The vineyard setting and the Mexican heritage are what offer up the most inspiration, though. Scenes in a beautiful kitchen and around the table are some of the most heartwarming in the film. We see Victoria, her mother and grandmother, and plenty of employees cooking in the kitchen; somebody is preparing homemade tortillas in the background. At the first dinner, we see a family favorite, Pumpkin Flower Soup. Abuelo (grandfather) is always sipping something or eating something. 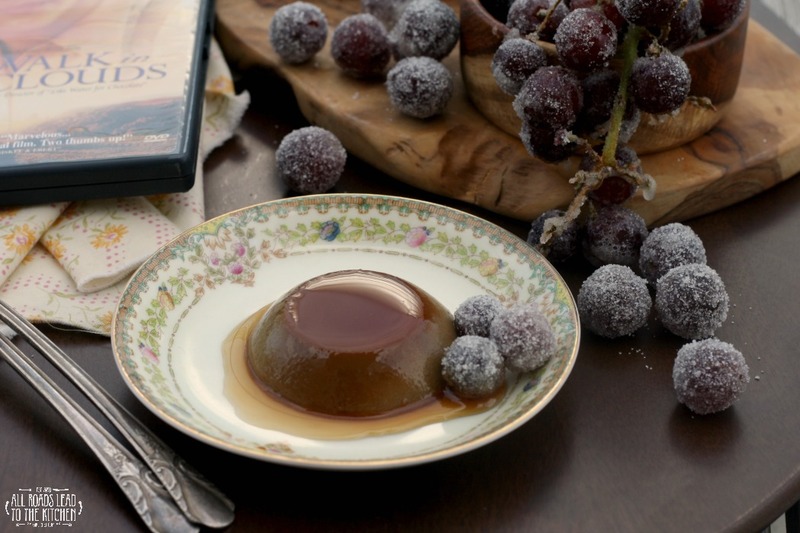 At one point he and Paul drink homemade Brandy at a table loaded with nibbles like cured ham, homemade bread, and the signature grapes that adorn every table scape in the film. But it was the actual grapes that inspired me the most. 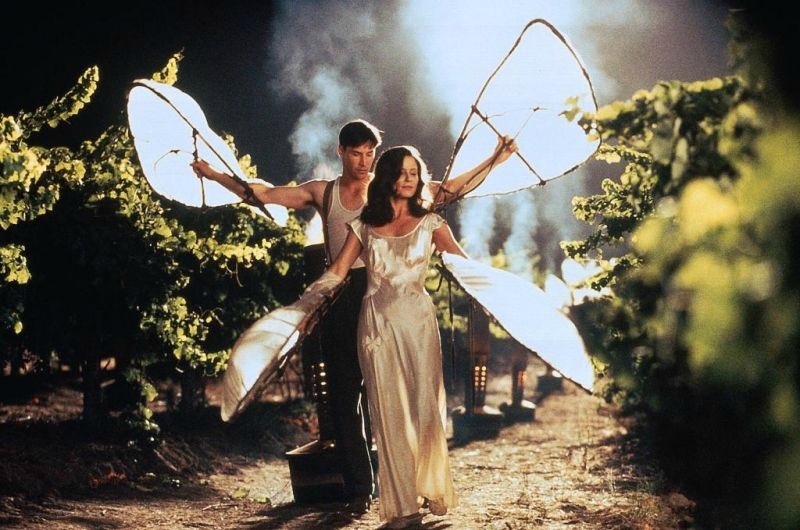 In the first half of the film we see grapes with a light frost on the outside, which led to the ridiculously cheesy wing-fanning of the heat from fires onto the vines to keep them from freezing through. I'm pretty sure this isn't really a thing, but I suppose it played into the sensual nature of the film nicely. So, frosted grapes came to mind. Then there was the stomping of the grapes, during which everybody changed "crush the grapes, crush the grapes, crush the grapes...". Grape Crush Cocktail anyone? And towards the end, the grapes were on fire, which brought roasted grapes (LOVE) to mind. I almost did a "fire and ice" themed dish or drink, but in the end decided to combine the idea of frosted grapes with chocolate (for Paul) and flan (as a nod to the Aragon's heritage). 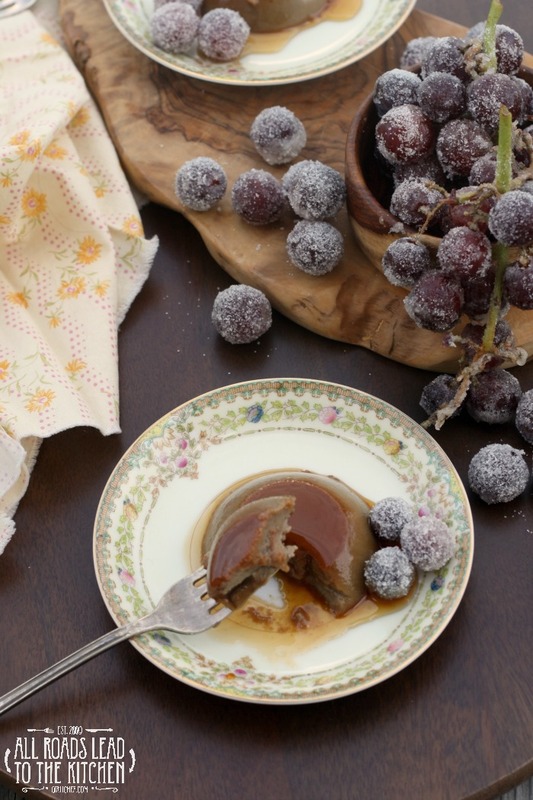 So, this miniature Chocolate Flan with Frosted Grapes is what I came up with. 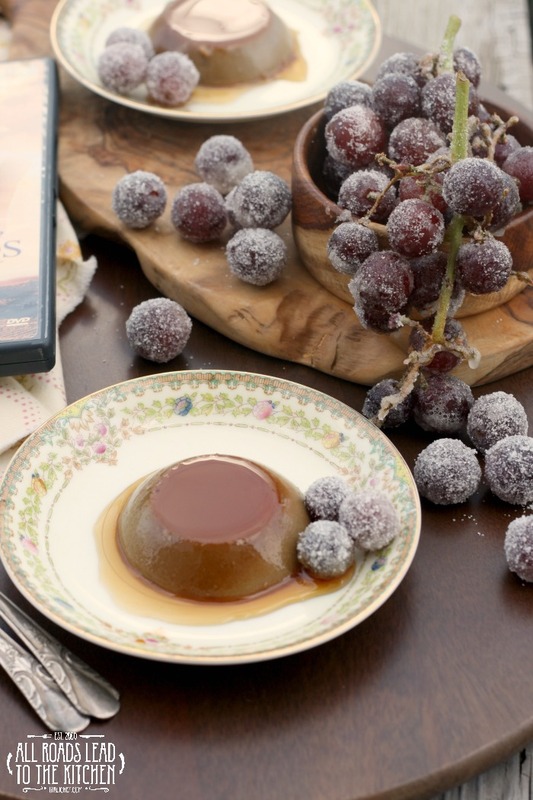 It's a very sensual dessert - creamy flan alongside slightly tart grapes coated in a sugar shell that pops between your teeth - therefore, I think it fits the movie perfectly. On a final note, I read that this was actually based on an Italian film from 1942 by the name of Four Steps in the Clouds. I'd love to see what a different 50 years makes, so I'm on the hunt to locate a copy! 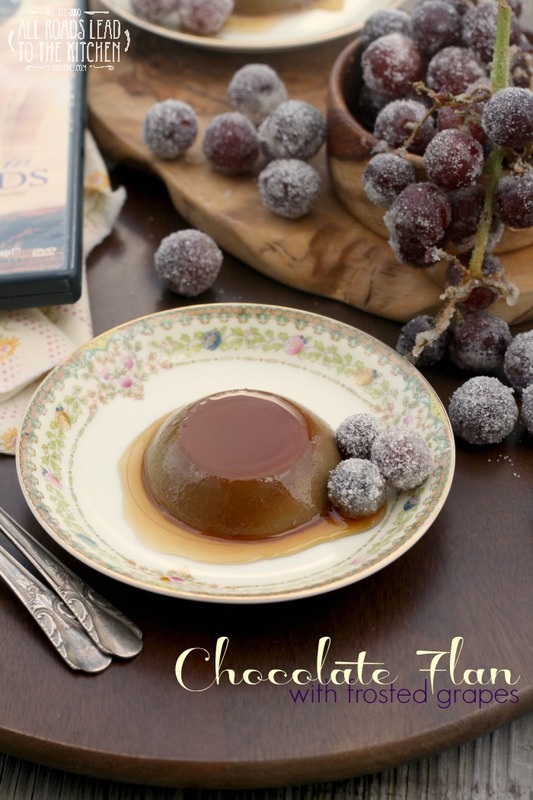 Creamy miniature chocolate flans served with grapes in a sugar shell. Preheat oven to 325° F. Set flan molds into a baking dish with 1 to 2-inch sides (depending on the size of your molds), leaving space between each mold. Bring a kettle (or medium pot) of water to a boil. Put the sugar into an extra-small saucepot set over medium-low heat; add 2 teaspoons water. Allow to sit, swirling and stirring from time to time, until all the sugar has melted into a golden sauce. Immediately remove from the heat. Divide evenly among the molds (~1 tablespoon into each mold). Set aside. Combine the remaining ingredients for the flan in the jar of a blender and blend until well-combined. Carefully pour into the molds, over the caramel (which will have set up a bit by now), leaving 1/4-inch of space at the top of each. Carefully set the tray into the preheated oven, then pour the boiling water into the pan around the molds about 1/3 to 1/2 of the way up the sides, taking care not to get any water into the molds themselves. Close the oven door and bake for 25 minutes, or until just set but jiggly. Carefully remove the baking pan from the oven. Let the molds sit inside the water bath for up to 10 minutes before lifting them out to cool completely. Cover the cooled molds with plastic wrap and refrigerate for at least 4 hours. Set the grapes out on a tray or work surface. Beat the egg white until frothy, then use a pastry brush to paint a thin coat of egg white onto the entire surface of each grape. Immediately sprinkle with the sugar, turning so that the sugar coats the whole exposed surface, then shake gently so that any excess falls off. Set the frosted (sugared) grapes onto a tray and allow them to set in a cool, dry place until ready to use. Make these the same day that you want to serve them because they don't hold well. Fill the bottom of the sink or a pan with warm water. Set the mold in it for 30-60 seconds, until you can move the mold back and forth and see the flan moving and "twisting". Position a platter upside down over the mold and flip them over in one turn. Allow caramel to drizzle down over the mini flans. Decorate with a few frosted grapes. 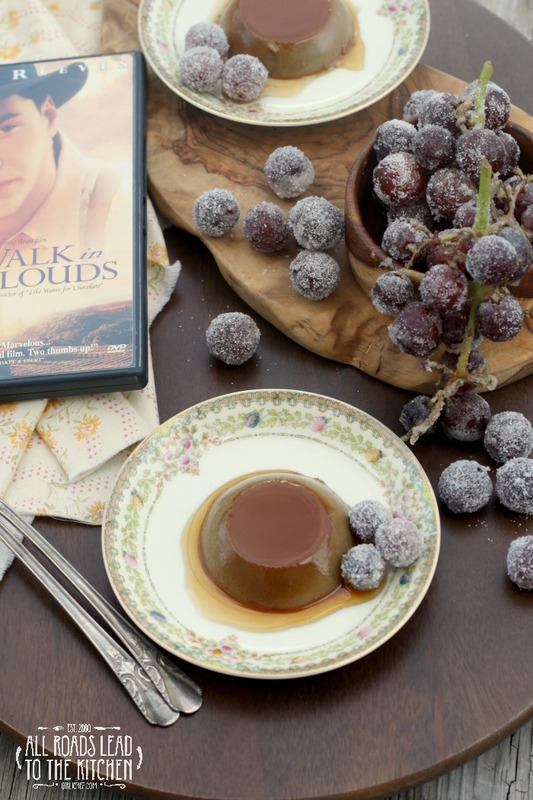 This month's edition of Food 'n Flix is being hosted by Wendy at A Day in the Life on the Farm with her movie pick, A Walk in the Clouds. If you'd like to join us, submissions are due on March 29 and you can find more information in her announcement post. Next month I will be hosting right here with my pick, Tampopo. If you have a blog, you are welcome to join in at any time!